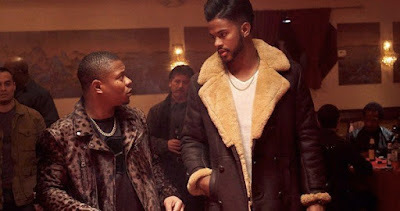 Straight Outta Compton and Mudbound star Jason Mitchell has dropped the first teaser trailer for Superfly, a remake of Gordon Parks' 1972 classic Super Fly (two words) starring Ron O'Neal. With beats by Future and Director X at the helm you probably guessed that it looks and sounds nothing like the original crime flick, but instead like a music video or an episode of Power. Contrary to my earlier report on this movie (dyslexic much, Travis? ), Mitchell is not playing Youngblood Priest, the Atlanta drug kingpin looking to get out of the game and survive to tell the tale. That role goes to singer/actor Trevor Jackson, while Mitchell plays Eddie. The rest of the cast includes Lex Scott Davis, Andrea Londo, Jacob Ming-Trent, and Omar Chapparo with room for plenty of celebrity cameos. Not gonna lie, I laughed out loud when I saw Jackson's tall hair and ridiculous beard, but I guess that's the style for cartel bosses nowadays? The original movie took heat for glorifying drug dealers and this footage won't quiet those who fear a remake might do the same. Mitchell is one of the dopest actors around, though, so I expect it'll be a better movie than it looks right now.